The third saddest child I think I’ve ever seen would be our son, tonight, right after the cliffhanger to part two of “Pyramids of Mars.” He didn’t completely break down, but his lower lip trembled more than I’ve seen it in a while. Almost frozen with fear, he huddled beneath his security blanket and said “I need a hug.” Thumbs were definitely down. “Pyramids of Mars” is the scariest thing ever. The first and second saddest children I think I’ve ever seen would be his older brother and sister, who saw this story in late 2003 or early 2004. They did indeed completely break down. There was screaming and there were tears and then there were two kids in bed with me. Even worse, I didn’t have this story in serial version at the time, I had a VHS copy of the compilation movie that was shown on public television. So these robot mummies that have indiscriminately killed everybody they’ve come across in the grounds of this old priory in 1911 and are completely unstoppable come charging into the lodge after – unbelievably – crushing a poacher to death between their chests, they smash the Doctor to the ground, kick the furniture over, and are about to strangle Sarah as the music swells. And, since I had no other way to do it, I just pressed stop in the middle of the mayhem. Screams. So “Pyramids of Mars,” which was written by Robert Holmes and directed by the brilliant Paddy Russell, has a reputation for being just about the perfect example of seminal, classic, scary Doctor Who. It’s the first time that the show consciously decides to be a Hammer horror film in the classic style with a sci-fi sheen. 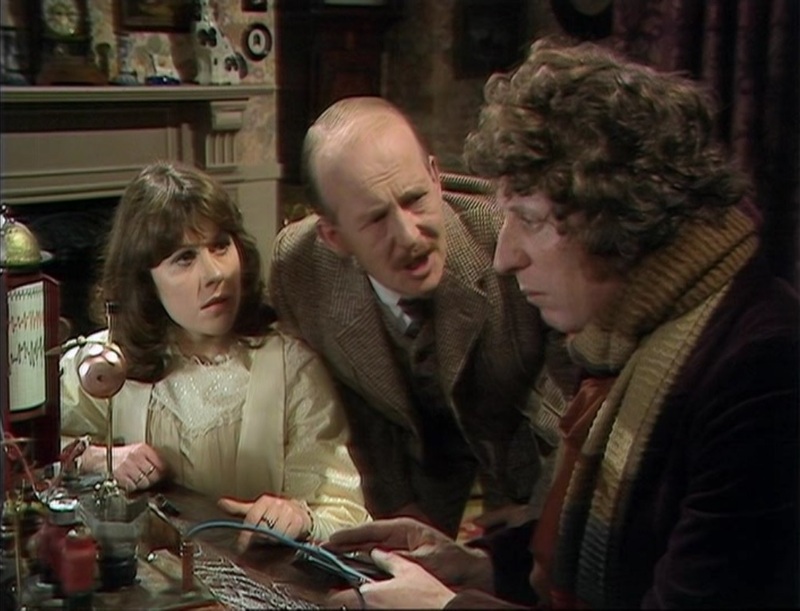 It’s mummies coming to life in a big old house in 1911, but they’re the robotic servants of the phenomenally powerful Sutekh, an alien who has been paralyzed in an Egyptian tomb for thousands of years. The Mars bit comes because the prison has two parts: the force field that keeps Sutekh motionless is on another planet, to keep anybody on Earth from screwing with it. But his jailers didn’t shut off their prisoner’s mind, and as soon as one of those rich Englishmen showed up to rob tombs in the name of archaeology, Sutekh took control of him and set the man and his robots to work freeing him from his prison. Bringing this to life (ha! ), you’ve got Bernard Archard playing the archaeologist as a walking corpse, and Michael Sheard as his unfortunate scientist brother. Peter Copley is another scientist who has a thing or two to say, sir, about all this unpleasantness before he gets killed. The sets are amazing, and the location filming is just terrific. Tom Baker is on fire in this story, as the Doctor knows that he’s up against the greatest threat that he’s ever faced, something that will change the course of history and destroy all life on Earth in 1911 unless he can find a way to stop it. Incidentally, for those mildly curious about these things, this story is the one that emphatically – and repeatedly – finally puts a firm date on the “present day” of Doctor Who. It’s five years ahead of the broadcast date: 1980. This will later get retconned. Some of us find this terribly amusing and entertaining. About nine people lose sleep over it. They all have book deals. When I was a younger, and much geekier, fan I used to dwell on the problems with dating the UNIT stories, and how Sarah Jane Smith came from 1980 but the Brigadier retired in 1977, or whatever the deal was. But nowadays I just chalk up any incongruities like this to the Time War mucking up history.